Just because you want food fast doesn't mean you should pick up fast food! 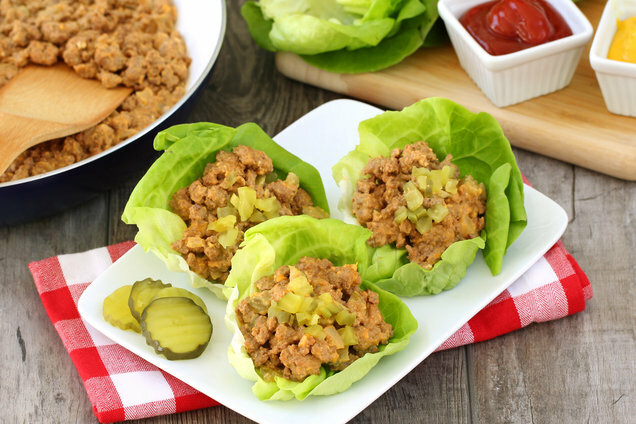 These healthy wraps have the burger flavor you crave, but they're sooooo much better for you. Plus, they're ready in just 20 minutes! Bring a large skillet sprayed with nonstick spray to medium-high heat. Add beef, onion, and seasonings. Cook, stir, and crumble until beef is fully cooked and onion has softened, 5 - 7 minutes. Remove skillet from heat. Add cheddar cheese, cream cheese, ketchup, and mustard. Stir until thoroughly mixed and melted. Stir in chopped pickles. Evenly distribute among lettuce leaves, about 1/4 cup each. Hungry for More Healthy 20-Minute Dinners? Happy July 12th, National Pecan Pie Day! How about adorable Crispy Pecan Pie Bites? Eat THREE for just 106 calories! Keep your pals stocked with easy recipes... Click "Send to a Friend" now!